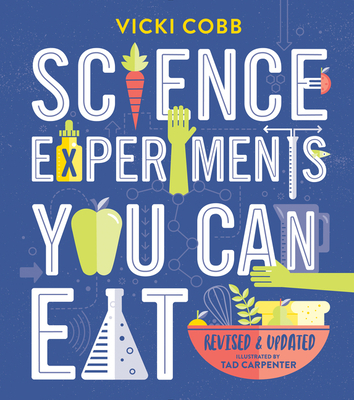 Kids take the reins in the kitchen with this hands-on book of edible science experiments. With contemporary information that reflects changes in the world of processing and preserving foods, this cookbook demonstrates the scientific principles that underpin the chemical reactions we witness every day—just by cooking. Vicki Cobb is the author of many award-winning science books for young people. With degrees from Barnard College and Columbia University Teachers College, Vicki enjoyed an early career as a science teacher. She now devotes all her time to writing and speaking to teachers, children, and librarians all over the country. She frequently writes for the Huffington Post and is also the founder and president of iNK Think Tank, an organization dedicated to getting high-quality nonfiction books into classrooms. To find out what recent science experiment Vicki has been cooking up, visit her online at www.vickicobb.com. Tad Carpenter is a designer, illustrator, teacher, and author. He has written and illustrated over a dozen books for readers of all ages. Tad runs his design and branding studio, Carpenter Collective, with his wife, Jessica, in Kansas City, Missouri. Visit him online at tadcarpenter.com.